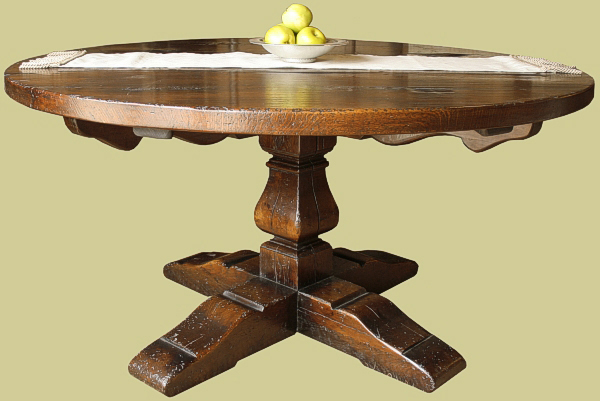 Round oak dining table, British handmade, with a 4.7cms thick top, on heavy section square cut baluster centre pedestal and cruciform feet. Available in several sizes (see drop down box below) to sit 4 to 8 people. We have one example, 152.5 cms diam. (5ft and comfortable 4-6 seater) available now for immediate delivery from our showroom stock, in 'Warm Chestnut' colour and medium aged (please contact us regarding availability, payment etc. on our immediate delivery furniture). For bespoke furniture orders, delivery is usually around 8-12 weeks. To get an idea of what this table would look like in your home, click Period style round oak dining table & panel back chairs.